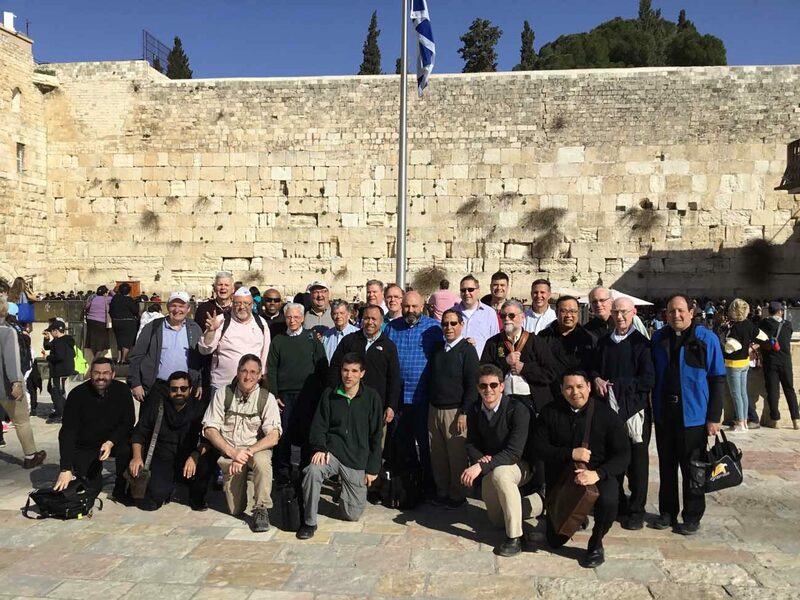 A group of priests from the Archdiocese of Philadelphia pose before the Wailing Wall in Jerusalem, one of many sites they witnessed during their nine-day pilgrimage and retreat to the Holy Land. Depending on ideology some call it Israel, others call it Palestine. To committed Christians, it is simply “the Holy Land” — not a tourist attraction but a place of pilgrimage. 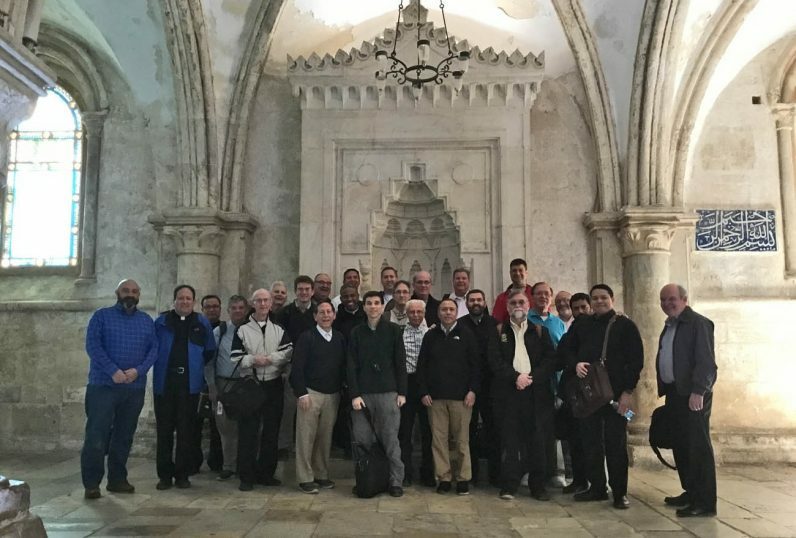 Two dozen priests from the Archdiocese of Philadelphia visited the Holy Land Jan. 29 to Feb. 6 for a combination pilgrimage and retreat. They ranged in age in the priesthood from Msgr. James McBride, 62 years ordained, to Father Matthew Biedrzycki, just two years ordained. The group also included one bishop, Bishop John McIntyre, who was a return visitor; and bishop-elect Joseph Coffey, who will be ordained an auxiliary bishop for the Archdiocese of Military Services on March 25. For him this pilgrimage served as his pre-ordination retreat. Those attending were really a cross section of the archdiocesan presbyterate in age and assignments. For examples, it included Msgr. William Kaufman of St. Pius X Parish, Broomall; Msgr. John Conway of Mary, Mother of the Redeemer, North Wales; Father Michael Hennelly of Sacred Heart, Oxford; Msgr. Daniel Sullivan, the vicar for clergy, Father Joseph Farrell of Our Lady of Consolation, Philadelphia; and Father James Oliver, currently serving in Rome, just to name a few. While the major liturgical celebrations of events in the life of Jesus center around Bethlehem where he was born and nearby Jerusalem where he died, much of the time in this particular pilgrimage was spent in Galilee, where Jesus spent most of his life, including his public ministry. 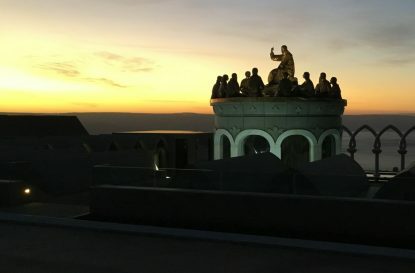 One of the priests on the pilgrimage took this photo at sunrise from their guesthouse, Domus Galilaeae International Center, overlooking the Sea of Galilee. Home base for most of the pilgrimage was at the Domus Galilaeae International Center, a guest house conducted by the Neocatechumenal Way which is located on the top of the Mount of Beatitudes overlooking the Sea of Galilee. There were stops at the Jordan River where John baptized Jesus, at Nazareth, Bethany and Cana, all of which helped bring the Gospels to life. This particular region with its vistas of mountains and sea was especially appreciated by the pilgrims, because it most closely resembles what the Holy Land looked like in the time of Jesus. Simply standing where Jesus preached, or celebrating Mass at the site of the Transfiguration or riding a boat on the Sea of Galilee was inspirational, the group agreed. Just as the surroundings of Independence Hall in Old City Philadelphia have little physical resemblance to the little colonial town where our founding fathers brought forth a new nation, so too do the Jerusalem and Bethlehem of today have little resemblance to the city and village that Jesus knew. But it is what happened there that remains important. The priest pilgrims took the opportunity to renew their ordination promises in what is believed to have been the Upper Room where Jesus consecrated the bread and wine and commanded his followers to do likewise. The Via Dolorosa — the path the Lord took to his execution — runs mostly through a bustling marketplace today but nevertheless remains meaningful for his modern-day followers. On the other hand Gethsemane, the olive garden where it is believed Jesus prayed the night before his death, is unspoiled. The olive trees, which experts believe are a thousand years old, may very well be the direct descendants of those that sheltered the Lord the night before he died. One suspects many a homily will come from this short pilgrimage by representatives of the Philadelphia clergy. But you don’t have to be ordained to be a pilgrim. It is well worth a visit by everyone. it is not the wailing wall, but the western wall..